360 pages | 42 B/W Illus. Conducting "business as usual" is out of step with today's rapid-fire, global economy. 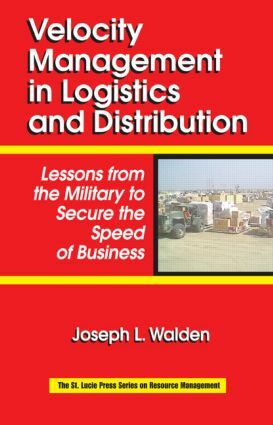 Velocity Management in Logistics and Distribution: Lessons from the Military to Secure the Speed of Business alerts commerce to the new reality that it must be more flexible and responsive in managing the unpredictability of its environment, particularly when it comes to the supply chain process. This comprehensive resource explains how to successfully migrate towards velocity management, which espouses replacing traditional reliance on mass quantities of inventory with receiving what is needed when it is needed - providing businesses with the ability to rapidly meet customers' ever-changing requirements. The velocity management paradigm is based on the highly successful example set by the United States Army, as illustrated by the author, a renowned speaker and retired colonel with more than 26 years of supply chain and leadership experience. He explains how the Army went from being mired in a mammoth, archaic, Cold War logistics infrastructure to achieving a lean, agile, world-class supply chain network. Chapters detail how this transition can be accomplished in the business arena. They relay aspects essential to achieving a successful supply chain: maintaining security, achieving velocity, and applying military theories, practices, and lessons learned. This invaluable and timely reference concludes with a summary of key themes and their relevant application to modern supply chains. "….makes logistics logical and emphasizes its importance."